Ranked the top resort spa in the Midwest according to Spa Magazine, Spa Shiki at the Lake of the Ozarks offers romance and a his-and-hers getaway at the Lake of the Ozarks for travelers this fall. Located on Missouri's Lake of the Ozarks, Spa Shiki at The Lodge of Four Seasons offers a romantic destination for fall travel. During the hot summer months, the Lake of the Ozarks bustles with boats and families. The cooler days of fall, however, create the perfect setting for couples to getaway to the lake. Named the top resort spa in the Midwest by Spa Magazine, Spa Shiki at The Lodge of Four Seasons offers two great spa vacation packages for fall at the Lake of the Ozarks. The Suite Deal focuses on luxury, and the Putt & Pamper Couples Package combines the best of the Lodge and Spa Shiki – golf and spa. The Lodge of Four Seasons’ Suite Deal package includes condo-style, king-size accommodations at The Residences at The Lodge (an Avila suite), featuring a private balcony or terrace, jetted tub, full-size kitchen and dining area, plus sitting area with fireplace. The package features two $25 Spa Shiki vouchers to apply toward two 50-minute spa services (or longer), an evening dinner credit of $50 in HK’s Restaurant on day of arrival, champagne and chocolates at turn down and a full American breakfast in Breezes Restaurant on the day of departure. Lake of the Ozarks guests who choose the Suite Deal package also enjoy a 2 p.m. late check-out. For those interested in booking a romantic Spa Shiki getaway at the Lake of the Ozarks, the Lodge of Four Seasons’ Suite Deal starts at $359 per couple per night (room occupancy taxes and resort fee not included). Guests who choose the Putt & Pamper Couples Package, a his-and-hers getaway, enjoy two rounds of golf at the Cove, designed by the Robert Trent Jones, Sr. or the Ridge, designed by Ken Kavanaugh – plus a 25-minute neck & shoulder massage and a 25-minute oxygen facial at Spa Shiki. With a two-night minimum stay, the package also includes breakfast for two each morning at Breezes. Package starts at $255 per person, plus tax and service fees. The Japanese-themed Spa Shiki features a complete spa experience for travelers, including salt-purified whirlpool, infrared saunas, eucalyptus-infused steam rooms, fireside spa sanctuary room, indoor/outdoor pool and fitness room. On its menu of massages, body treatments, facials, wraps, hydrotherapy, pedicures, manicures and salon treatments, Spa Shiki offers a Duet Massage, perfect for couples. Spa Shiki’s Duet Massage features complete body massages for two performed side-by-side using laminaria oil (100 percent pure seaweed oil, improves skin tone and vitality) and an aromatic blend of essences selected for their relaxing, soothing and mood-enhancing properties: ylang ylang, bergamot, lavender, armoise and geranium. For more information on Spa Shiki and the Lodge of Four Seasons, visit http://www.spashiki.com or http://www.4seasonsresort.com. 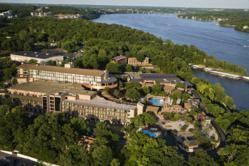 The Lodge of Four Seasons is located waterfront at the Lake of the Ozarks, one of the world’s largest manmade lakes and one of the Midwest’s most popular vacation destinations. In addition to Spa Shiki, resort guests enjoy a variety of amenities, including the lodge’s full-service marina, swimming pools, fitness center, cinema and more. The Lodge of Four Seasons offers 54 holes of championship golf on links designed by Robert Trent Jones, Sr., Ken Kavanaugh and Jack Nicklaus. Spa Shiki is managed by Spa Insight Solutions.